Just like the very popular Shrockworks Stubby Front Bumper, the new Mid-Width Front Bumper is laser cut and CNC formed out of 3/16″ steel plate, comes complete with a winch plate that can accept most 9500 lbs. winches including the new WARN PowerPlant, a skid plate which will effectively protect the Rubicon electronic disconnect, (2) D-Ring mounts, (2) off-road light mounts, a winch hoop and it will allow you to keep your factory fog lights. The installation of the Shrockworks Jeep JK Wrangler Mid-Width Front Bumper is just as simple to install as the Stubby and can be done by yourself. If you can employ the help of a friend, you should be able to complete the installation in about an hour or two at most by following the write-up below. • The main body of the bumper is constructed of high strength 3/16″ steel plate, laser cut, CNC formed and meticulously welded and finished by skilled craftsman in the USA!. Compare our standard features to the competition! • A removable 3/16″ steel SKID PLATE that wraps underneath is included! This skid plate wraps far enough under that it will also protect the sway bar disconnect motor found on all JK Rubicon’s and some other 2007 + Jeep JK ‘s. Since the skid is removable, it can be easily replaced if damaged. That’s not likely to happen though. The skid is formed specifically for strength. The edges are bent up on the sides. It has welded gussets on the back side, and it’s made from the same high-tensile 3/16″ steel plate as the bumper itself. This is probably the most damage-prone area on a Jeep. Many bumpers have a flimsy flat piece of flat plate in this area. One good hit there, and the whole bumper is bent & toast. Others charge you extra for a skid plate. We consider it a necessity and include it as a std. feature. • Massive 1″ thick plate steel Shackle / Recovery points are included as a std feature. These tabs are are welded front & back, and they are designed in such a way that even if the welds were to fail, the recovery points themselves are still held in the bumper (see CAD pic on right). • Winch mount plate included. There is nothing else needed to mount a winch. Just bolt it on and go! Accommodates most winches up to 9500 lbs, including hard to fit winches like the new Warn Powerplant HP winch. • Lighting options. Built-in light tabs on top of the bumper for aftermarket driving or fog lights. Recessed light mounts in the front face of the bumper accept the factory fog light or PIAA 510 4″ lights, either the driving or fog version. If you already have the stock lights, select none in the options. If you don’t have the stock fog lights, we recommend buying the PIAA lights. They are much higher quality that the stock fog lights and cheaper too. • Optional winch opening cover for a clean look w/o a winch. This plate will also accommodate an additional set of off-road lights on top of the bumper. A license plate will cover the fairlead opening. (coming soon). • Available with your choice of no top tubing ora a low profile winch height hoop (as seen in the pics here). • Finish options are: bare steel, semi-gloss black powder coat, and a semi-matt finish textured black powder coat. The pics here are of the Textured Black. Winch compatability: All of the winches listed on our www site will fit. MOST winches b/t 8000 & 9500 will fit. Known exceptions: Warn 8275, Superwinch EP & EPi, any worm gear style winch (these are typically industrial winches such as the ramsey RE 12000 and look very different from normal winches) The Tmax short-drum comp winch and the Warn 9.0RC will require re-drilling some holes. The Ramsey short-drum comp winch will bolt up w/o any mods. • 1″ thick steel recovery points. • Bolt on, no drilling or cutting. • Proudly made in the USA! Fits the new 2007+ Jeep JK Wrangler, 4 door Unlimited & 2 door. Rubicon, Sahara and X models. • All ShrockWorks bumpers are made to order to your specifications, so please allow 3-4 weeks for you bumper to be made for you. This is a shot of everything you will get with your new Shrockworks Mid-Width Front Bumper. Be sure to verify that you have everything before you start on this project. 1. Begin the installation of your new Shrockworks Jeep JK Wrangler Stubby Front Bumper by unscrewing the 4 plastic screws securing the factory air dam to the bottom of your front bumper. A phillips screwdriver will be needed for this job. 2. Once unscrewed, you should be able to pull out both the plastic screws and inserts with little effort but if you find that your screws are just spinning (as several of mine did), you will need to wedge a flathead screwdriver or small pry bar between your JK’s plastic bumper and air dam to help you force it out as shown in this photo. 3. 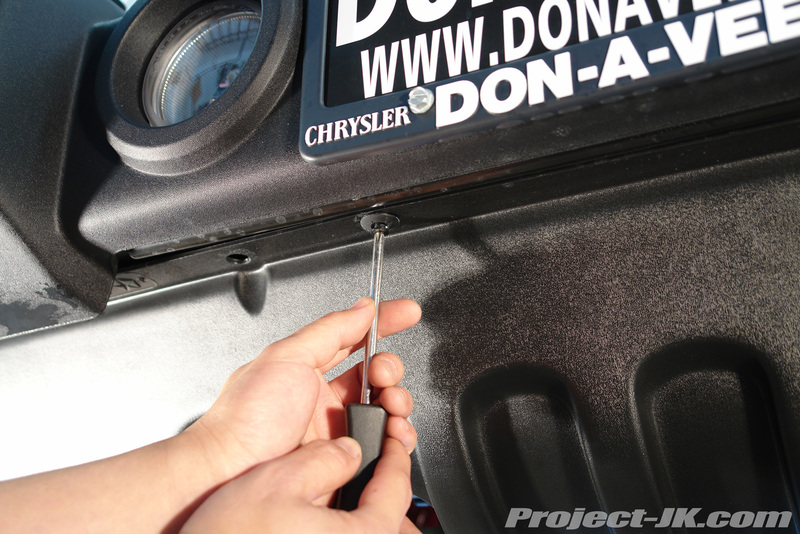 Now, climb under the front of your Jeep JK Wrangler and using a phillips screwdriver, remove the remaining 2 plastic screws securing the air dam to the lower cross member. As before, if these screws just spin in place, use a flathead screwdriver or small pry bar to help you force them out. Your air dam should now be free of your Jeep and it can now be discarded as it will no longer be needed. 4. If your Jeep JK Wrangler came equipped with factory fog lights, climb under the front of your Jeep, look up behind the front bumper, locate the wiring harness plug, lift up the clip and then pull it off as shown in this photo. 5. 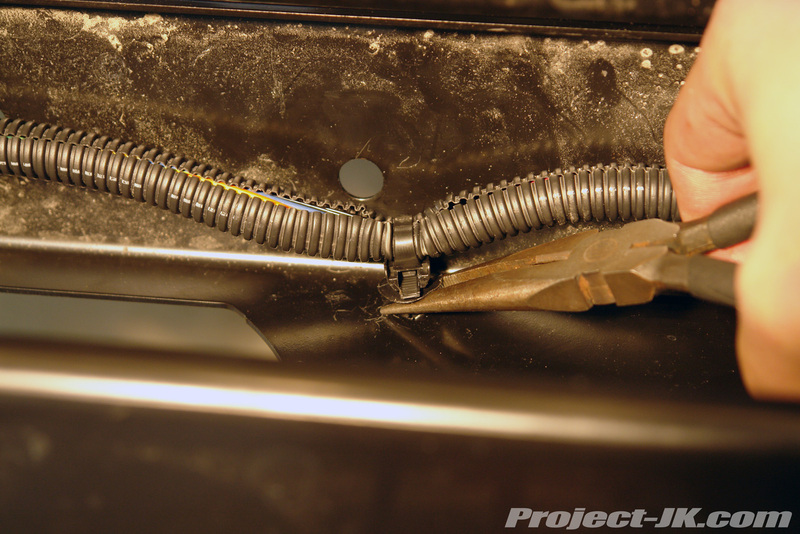 Using a pair of needle nose pliers pry off all the fog light wiring harness connectors on the back of your Jeep JK Wrangler’s front bumper. 6. Using an 18mm socket, remove the 4 bumper mounting nuts (2 on each side) located next to the inside of your Jeep JK Wrangler’s frame rails and fog light holes. 7. Using an 18mm socket, remove the 4 bumper mounting nuts (2 on each side) located next to the outside of your Jeep JK Wrangler’s frame rails. 8. 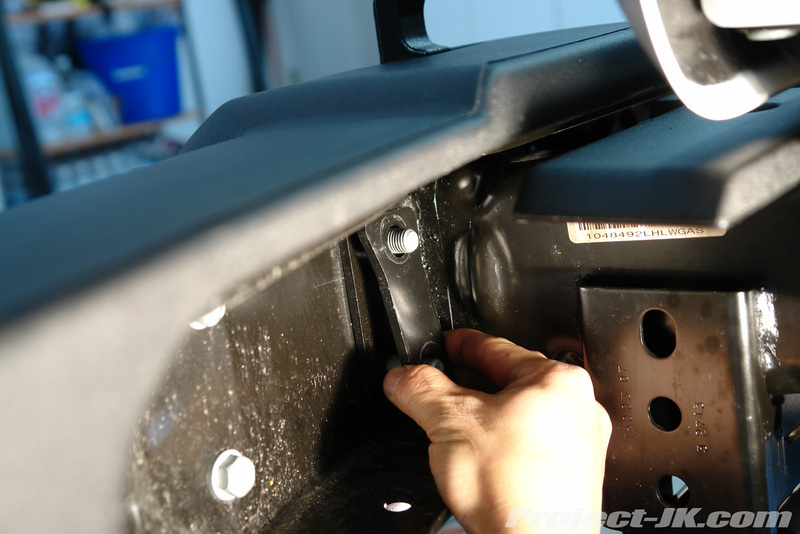 Remove the backing plates off the bumper mounting studs as shown in this photo. 9. 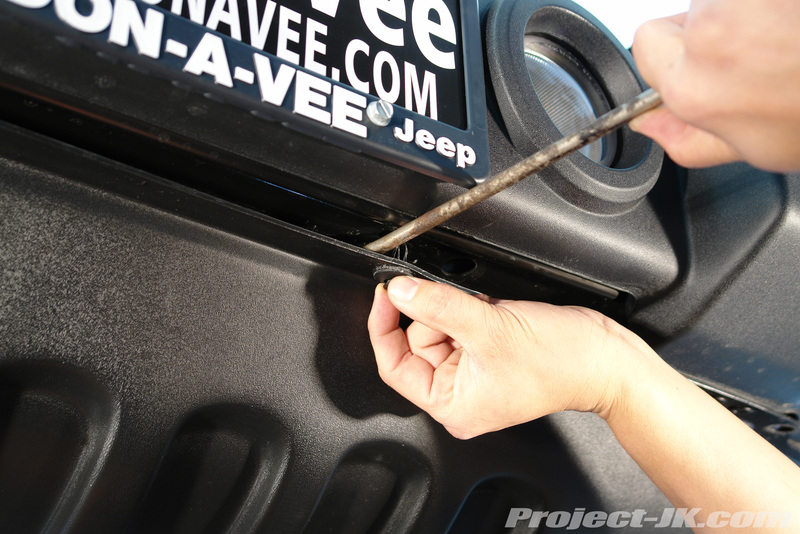 Carefully pull off your Jeep JK Wrangler’s front bumper off the frame rails. If your JK came equipped with factory tow hooks, grab and use both of them to carefully pull your front bumper off the frame rails. 10. Using a phillips screwdriver, remove the 2 plastic screws securing the top plastic cover in place. 11. Again, if you find these screws to just spin in place, use a flathead screwdriver or small pry bar to help you lift up the cover off the frame rail and force the screw out. 12. 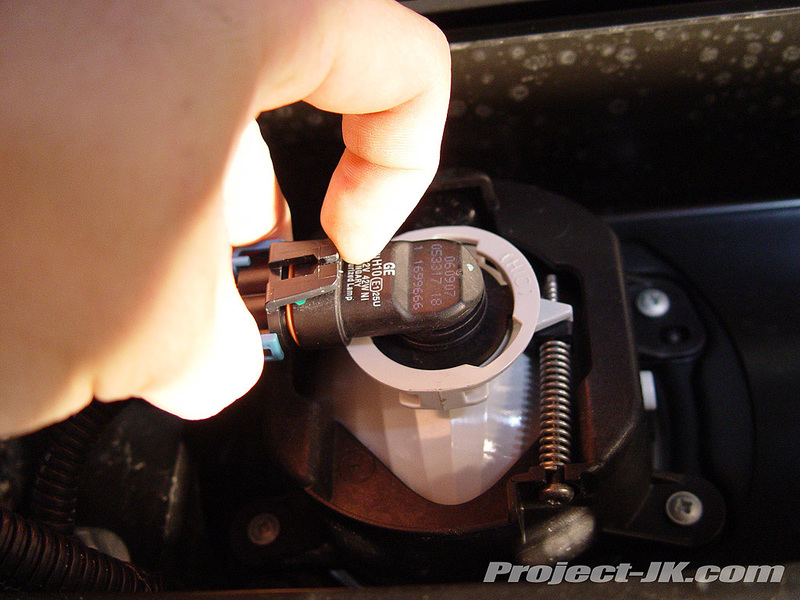 Using a pair of needle nose pliers pry off the fog light wiring harness connectors attaching it to the frame rails of your Jeep JK Wrangler as shown in this pic. 13. Take the Shrockworks winch plate and insert it vertically between your Jeep JK Wrangler’s frame rails so that the long folded edge is pointing up and facing forward and where the frame mounts on the sides are pointing down as shown in this pic. 14. Using the 1/2″ bolts, nuts and washers provided with your Shrockworks front bumper, loosely secure the (2) winch plate side mounts to the existing holes on your Jeep JK Wrangler’s frame rails as shown in this pic. 15. Slide the thread clips provided over the 4 small holes on the fog light mounting plate located on the back side of your new Shrockworks Mid-Width Front Bumper as shown in this pic. 16. Using a 5/8″ socket and wrench, mount and secure your roller or hawse fairlead to your Shrockworks Mid-Width Front Bumper. 17. Carefully place your new Shrockworks Mid-Width Front Bumper on top of the frame rails of your Jeep JK Wrangler. 18. Lower the winch plate down into the Shrockworks Mid-Width Front Bumper so that it is resting on the inside lower lip. Next, lift up the bumper so that you can line up the mounting holes to the frame of your Jeep JK Wrangler and then loosely secure it in place using the (8) 1/2″ bolts, washers and nuts provided as is shown in this pic. 19. 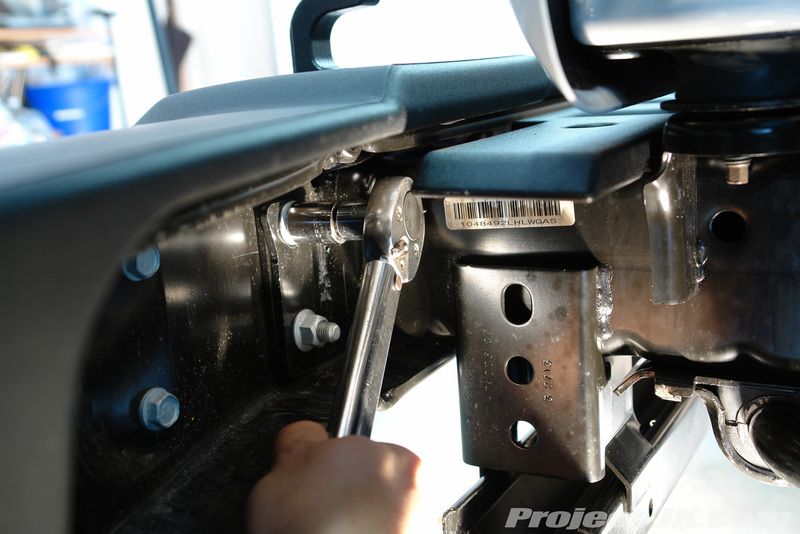 Using a 3/4″ socket and wrench, tighten up the (4) mounting bolts and nuts on the inside of your Jeep JK Wrangler’s frame rails as shown in this pic. 20. Accessing the bolts and nuts through the fog light holes on your Shrockworks Mid-Width Front Bumper, tighten up the (4) mounting bolts and nuts located on the outside of your Jeep JK Wrangler’s frame rails using a 3/4″ socket and wrench. 21. Make sure that the adjustment screw is pointing down and then install your Jeep JK Wrangler factory fog lights to the back side of your Shrockworks Mid-Width Front Bumper using the small screws provided. A phillips head screwdriver will be needed for this job. 22. To tighten up the Shrockworks winch plate side frame mounts, place a 3/4″ socket up through the vertical frame supports and onto the head of the 1/2″ bolt you installed earlier. Then, insert a 6″ ratchet extension through the hole on the vertical frame support and connect it to the socket on the inside. 23. Attach your ratchet to the extension and then tighten down the bolts securing your Shrockworks winch plate side mounts to the frame rails of your Jeep JK Wrangler. 24. Carefully place your new winch down into your Shrockworks front bumper and onto the winch plate. Notice there are (2) sets of mounting holes, one to accommodate most winches and the other to accommodate a WARN PowerPlant. 25. 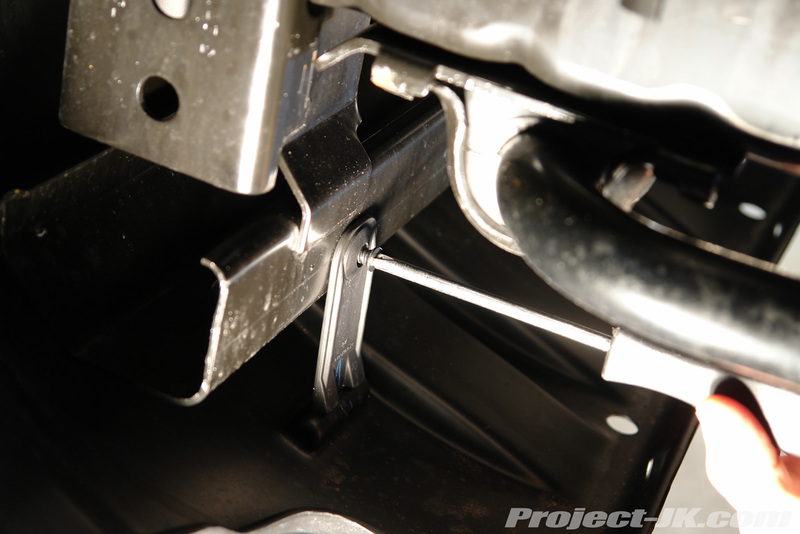 Insert the square nuts into the mounts of your winch as shown in this pic. 26. From underneath the Shrockworks Mid-Width Front Bumper, secure the (2) rear mounts (closest to the grill of your Jeep JK Wrangler) using the 3/8″ bolts and washers provided. 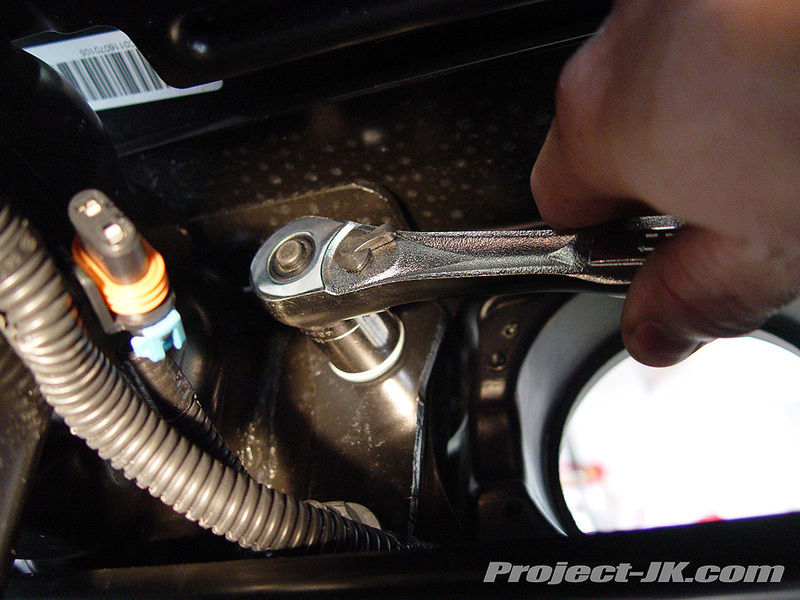 Tighten these bolts using a 9/16″ socket. 27. Have a friend hold up your new skid plate up to the base of your Shrockworks front bumper and Jeep JK Wrangler lower cross member and then secure the outer two mounting holes in place using the 3/8″ bolts, washers, lock washers and nuts provided and as shown in this pic. The (2) mounting holes in the middle will only require the use of bolts and washers as they will connect to the forward mounts of your winch. 28. 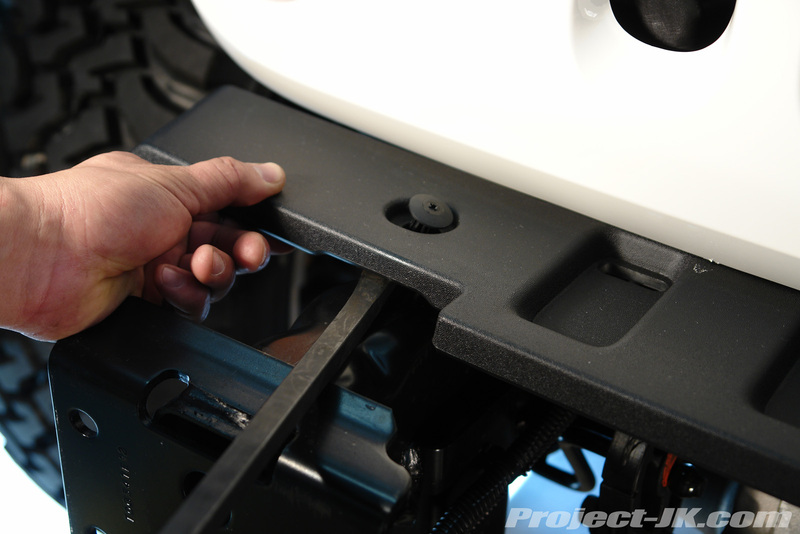 Place the large fender washers included with your Shrockworks front bumper inside the lower front cross member of your Jeep JK Wrangler as shown in this pic and then use the remaining 3/8″ bolts, nuts and lock washers to secure the skid plate in place. 29. Using a 9/16″ socket and wrench tighten all the bolts and nuts securing the front mounts of your winch and your Shrockworks skid plate to the front bumper itself and to the lower front cross member of your Jeep JK Wrangler. 30. If you have aftermarket off-road/driving lights, you can now install them onto your Shrockworks front bumper using the mounts provided. And that’s pretty much all there is to it. You now have the front end of your new Jeep JK Wrangler armored up with a great looking Shrockworks Mid-Width Front Bumper that also allows you to keep your factory fog lights. Please let me know if you have any questions. On Step 21, I might advise that it’s not the wiring harness of the factory fogs that needs attention, it’s the orientation of the adjustment screw – it needs to be facing down. Wrong installation will result in the light cutoff being in the wrong direction. I’m sure nighttime drivers coming at you will alert you that it is installed incorrectly! Remember to adjust the lights after the install. RubiRedJK, if you are refering to the winch, it is a WARN M8000. The solinoid is custom mounted behind the grill. Ya I’m retarded! I meant the which winch… DOH Thanks!!! Did you just fab up a bracket to mount it behind the grill? I was thinking about doing the gutter guard grill mod but that would prevent me from getting to the solenoid… Maybe I could mount the solenoid with the remote connection pointed up so I could get to it by opening the hood… Would there be any problems with installing it that way? Any other ideas? What are the other specs on that Jeep? Is the wheel/tire combination Soft 8s/MT MTZs? What sizes, and how big of a lift? The whole JK looks great! Hi Nick, the Jeep you are looking at belongs to Jason (SDMF on JK-Forum.com) and it has a Currie Rock Jock Suspension System which gives you about 5″ of lift up front and 3″ in the rear. He also has a set of 1″ spacers in the rear. With the addition of a heavy bumper and winch, everything sits perfectly level now. Tires are 35×12.50 Cooper SST’s on a set of 15×8 Soft 8’s. Can you confirm the finish on this ShrockWorks Mid-Width install. Semi-gloss or textured matt? Looks like it might be Semi-Gloss. Also do you have any updated info on the winch cover plate? Still says coming soon. I am ready to order one just wanted to confirm what finish I want. What are your opinions on the 2 black finishes? I have the semi-gloss and think it looks WAY better than the textured mat. Regarding the cover plate, I’m pretty sure it should be available now. What is the weigh of the bumper? will I have to lift the jeep up because of the bumper? It’s heavy but if you are only installing the bumper, I don’t think you will see enough of a sag to notice. If you add a winch, you might want to install 3/4″ coil spacers to make up the difference. Stock harness will not reach (spread) far enough to reconnect both fog lamps in their new position. Any tricks or ideas other than cut & splice? I’m pretty sure that Jeep makes an extension for the harness and it is available at your dealership. Last I heard, they are looking at about 4 weeks right now. Reguarding the bumpers and winch on a stock 08 Rubicon 2dr. Midwidth along with the Warn Powerplant HP . postings here have a 3/4 inch spacer. will this apply to my combination? or will I need an additional lifs,also Shrockworks rear bumber to be added next month? Yes, to help compensate for the sag you will see, 3/4″ spacers should level you out nicely even if you will be installing a rear bumper as well. richard, there are NO air bag assembly, electronic sensors or other wise in the factory bumper. your air bags are controlled by sensors that are attached to the bottom of your passenger side seat. the factory bumpers do have what are called ‘crush cans’ and they are designed to help absorb low speed impacts but they are only as effective as if they get hit. in other words, if you hit a pole dead center, they will not get hit and they will not help you out. needless to say, you do not ‘need’ the crush cans. I just installed this bumper and the wiring harness for the factory fogs only reaches one side. Does Mopar have extensions? Have you seen any of these bumpers (or the shorty shrocks) with a winch cover plate yet? If so, is it a clean look? Would it work well with a low profile rock crawling set up like the Superwinch Rock 95? I figured I could always use a remote for the winch operation and just remove the cover plate occasionally for access to the winch when needed to respool, etc..
What type/size wheels and tires are you running? Are you using any wheels spacers? 35″ cooper sst’s on crager soft 8’s and no wheel spacers. How difficult would it be to install a winch after this bumper is installed? Looking at getting the bumper first and then the winch later down the road. Thx! it won’t be too bad but, you will still need to loosen things up.